I can’t believe that Elia is turning 18 today!! 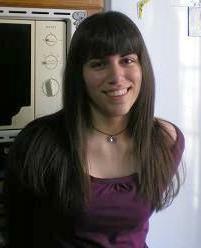 My little girl has grown into a beautiful woman, who will soon be going to university, she will have the right to vote, etc., etc., but she will always be our little girl. 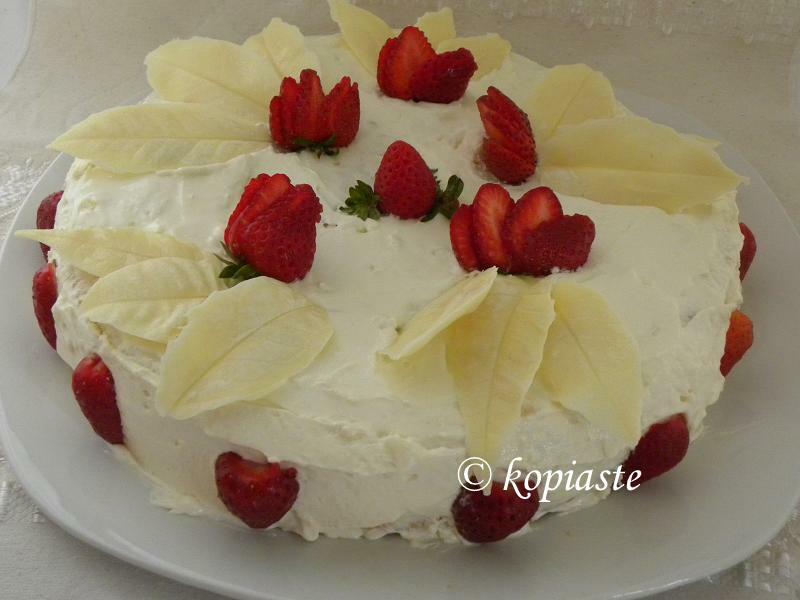 Today I am spoiling her (more) with her favourite food and I’ve made a special cake with white chocolate and strawberries, which she loves. She told me that she didn’t want pastry cream in it, so I’ve made it with whipped cream inside and a cream cheese / butter / white chocolate/ whipping cream frosting outside. I wanted it to look really beautiful so I decorated it with chocolate leaves which I made, as well as with strawberries inside and outside. 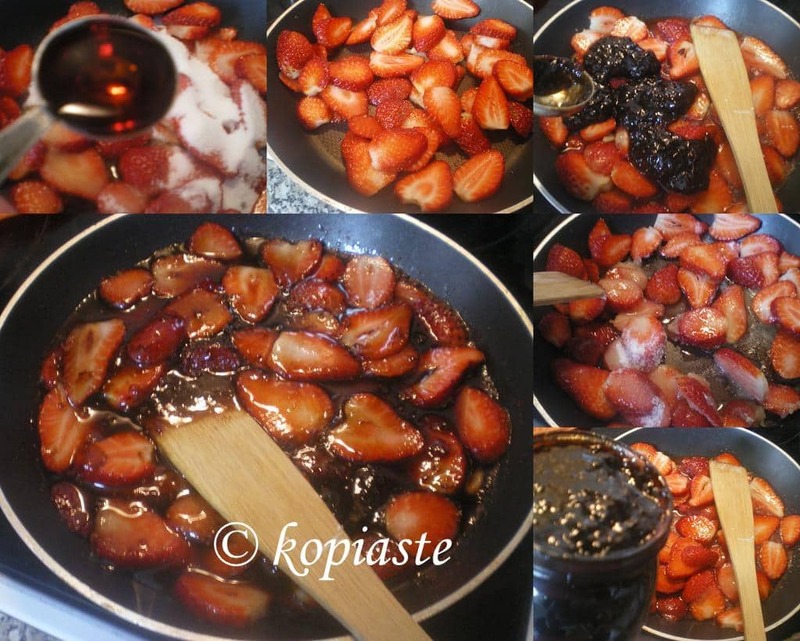 Inside, I made a strawberry syrup by using fresh strawberries and rum in which I added a strawberry jam (will you believe that it is the same one I made two years ago and it is still perfect!!!). I prepared everything yesterday and this morning I just assembled the cake. 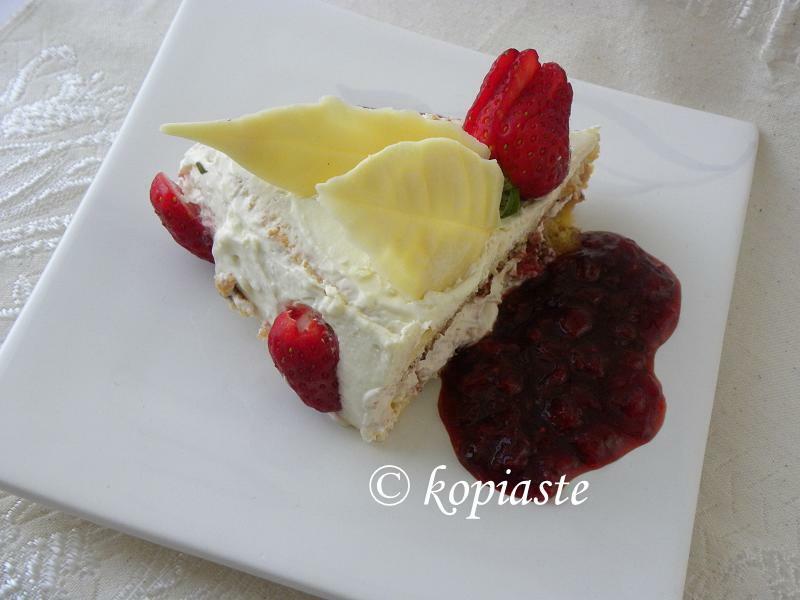 Today I had some leftover strawberries, so I made an extra amount of strawberry sauce, only this time the strawberries were cut into smaller pieces, which I served with the cake and beliveve me it was delicious and one of my best cakes. 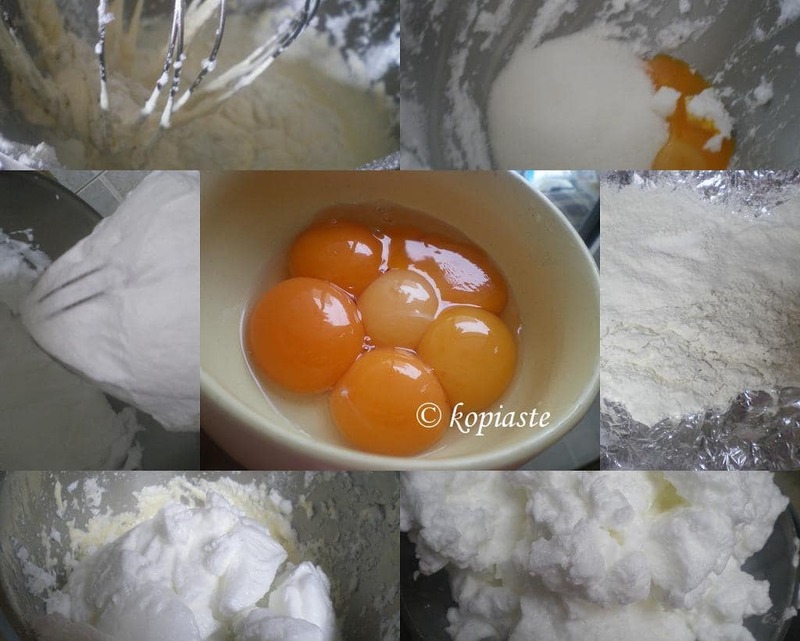 Prepare sponge cake, preferably from previous day (See here for step by step instructions.) I baked it in a 28 cm baking tin. In the mixer whip the heavy cream with the half amount of sugar and vanilla until peaks form. Divide whipping cream and refrigerate half of it. 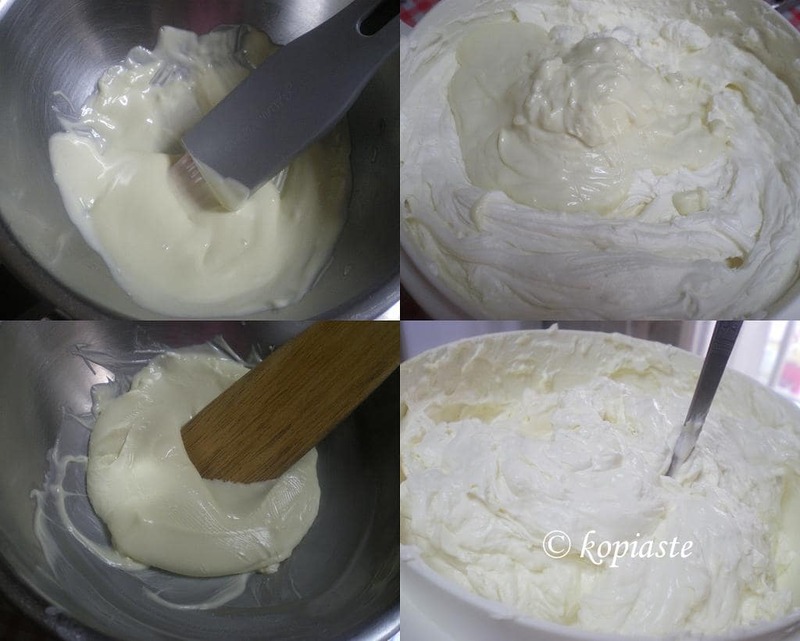 In the remaining whipped cream, add the remaining sugar and vanilla and cream cheese. Whip and refrigerate. In a double boiler, melt the chocolate. 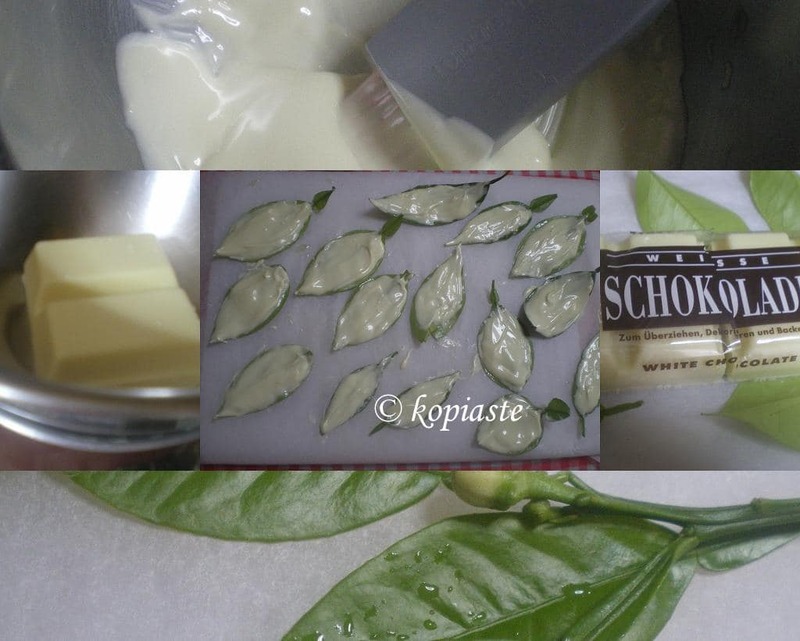 Use half of it to prepare the leaves and when the remaining has cooled, mix it in the cream cheese mixture. 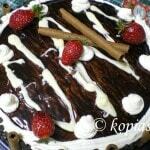 If you want to decorate the cake with a piping bag, reserve some of the mixture before adding the chocolate. I used 15 bitter orange leaves but you can use leaves from any citrus tree you like. Wash the leaves and pat dry. Lightly brush them with oil and then with kitchen paper wipe most of the oil off. Line a tray with parchment paper and place the leaves with back side facing up. With a kitchen brush, add a layer of chocolate. Repeat with a second layer. Refrigerate for a few hours before using. When done, melt the remaining chocolate and when it begins to cool, mix it with the cream cheese mixture. Wash the strawberries, remove stem and cut them into slices. Place in a non stick frying pan without drying them. Add sugar and rum and mix till the sugar dissolves. Add the jam and simmer for a few minutes until the jam dissolves and the sauce becomes thick. 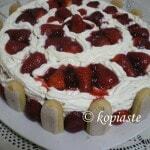 Divide the sponge cake and put one piece of the sponge cake in a platter and put back the cake ring of the spring. 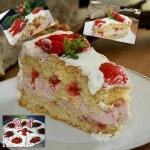 Wet both sponges with the strawberry syrup. 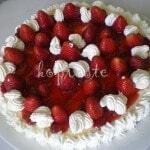 When the strawberries cool, add the whipping cream and then the remaining strawberries. 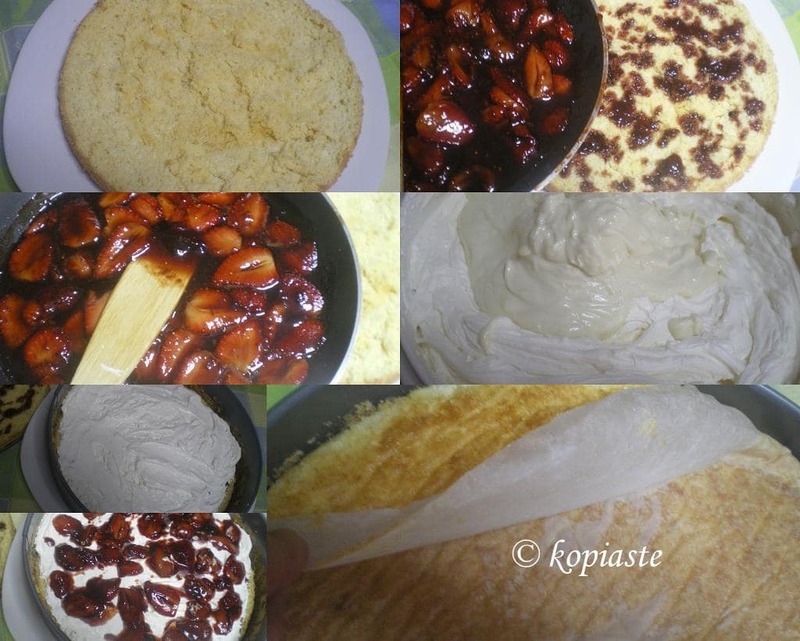 Cover with the second sponge cake. Add the cream cheese mixture and decorate with chocolate leaves and strawberries.